Are you starting to prepare for the holidays by organizing supplies like wrapping paper? If you want an easy way to keep all of your supplies handy for the holidays or any other time, a custom solution might be ideal. All you need to do is make a DIY gift wrapping station. 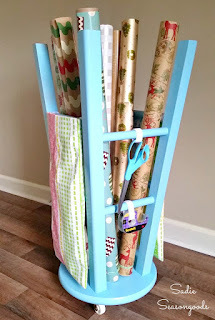 Making a simple DIY gift wrapping station will be really easy to do and no construction is required. All you will need is an old wooden stool and a few optional accessories. However, there may be some preparation to do before the real fun can begin.